We all know that yogi who walks around with her head in the clouds. The one who’s always running late, who “forgets” to return phone calls and text messages, and cancels plans at the last minute. It’s nice to live a carefree life, but it’s not the best way to get things done, or to respect yourself and the people around you. But there’s good news! Even the flightiest among us can work on coming down to earth. This series of yoga poses will help you get grounded. You’ll do the whole sequence twice (once through on each side), then relax into a peaceful restorative pose. Press the soles of your feet into the ground and keep the idea of grounding in mind as you practice, and experiment with long holds in the poses that you feel most challenged in. Keep your hands at your waist and concentrate on grounding into your standing foot as your spine lifts. From Vrksasana, step your lifted leg back to a Lunge Pose. Open the back toes out for Warrior II. ...And step back to Downward Dog. 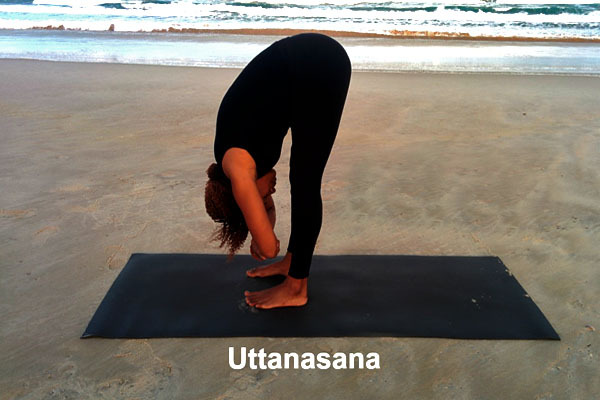 Step both feet forward to Uttanasana and hold for several breaths. Step back into Mountain. Then repeat on the other side. Once you’ve completed the whole sequence on both sides, rest in Viparita Karani (Legs-Up-the-Wall Pose). As you rest, envision your body sprouting and growing roots into the ground below you.